Arianne experiences a rare occurrence of family togetherness on the night of the Perseid meteor shower. As Arianne, her mother, and her brother lie on blankets in the pasture, their old pony comes to join them. The pony goes running off when one of the shooting stars seems to come to Earth, and a year later that old pony becomes the mother of a mythical beast. The baby centaur sends Ari’s life into chaos. But it also causes great changes to the insular life Ari has led since her brother was born. Her brother’s serious birth defects caused her father to flee family life and forced her mother to bear the work of the stable as well as the work of raising a disabled child. 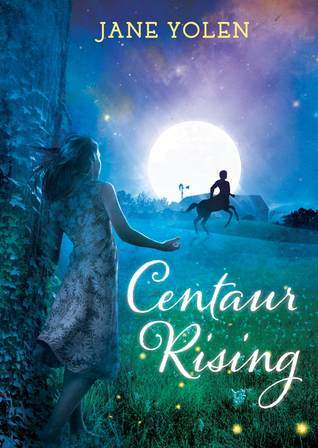 The baby centaur provides an utterly new perspective and quickly causes Ari and her whole family to change how they see the world and their places in it. This is a lovely story about a family embracing life’s difficulties and joys. It uses fantasy to show realistically and yet hopefully how families might approach troubles that might befall them. The characters are appealing and true. An important theme in the story is choosing the right or proper path, an important consideration in a society that often chooses the path that is easy or the path that brings wealth over the path that is morally right. The characters question their own motivations and those of others as they wrestle with how to responsibly deal with a baby centaur as well as how to responsibly live their own lives. I think some young readers will be enraptured with the fantasy element of this book while others will embrace the more philosophical issues that are raised. It may also awaken or feed a love of Greek mythology and the study of the constellations in young readers.